Many years ago (in 1928 to be precise) one of the cleverest of all scientists, J.B.S.Haldane, wrote an essay that became famous for explaining why there is a best size for every animal. In On Being the Right Size he pointed out that the giants who beset the hero of The Pilgrim’s Progress had a problem, unmentioned by John Bunyan, in being not only ten times the height of ordinary man but ten times as wide and ten times as thick. They were therefore one thousand times heavier and, as the human thigh-bone fractures under about ten times our normal weight, the giants would have broken a leg at every step. Going in the other direction, so to speak, JBS noted that insects don’t have oxygen-carrying bloodstreams because what little oxygen their cells require can be absorbed by simple diffusion of air through their bodies. That’s because gases can diffuse easily through very small distances but are slow to spread further afield – meaning that regions of an insect more than a quarter of an inch from the air would always be short of oxygen. In consequence hardly any insects are much more than half an inch thick and we can relax, safe in the knowledge that the giant, man-eating spiders beloved of science fiction are indeed the stuff of fantasy. Larger animals have to take a radical approach to the problem of supplies – Bunyan’s giants needed a thousand times as much food and oxygen as ordinary man and their levels of waste production don’t bear thinking about – the point being that bigger creatures, even if not giants, required the evolution of oxygen-carrying bloodstreams and pumping systems to reach all their cells. So successful has this ploy been that, from the emergence of the first fish and amphibians 500 million years ago, we have 64,000 vertebrate species today. Their range is truly astonishing – from tiny frogs less than half an inch long found in Papua New Guinea to the blue whale, averaging 110 tonnes and 24 metres in length and thought to be the largest animal of all time. The African bush elephant is the largest land animal (about 5 tonnes) and birds can get up to 150 kg if they give up flying. 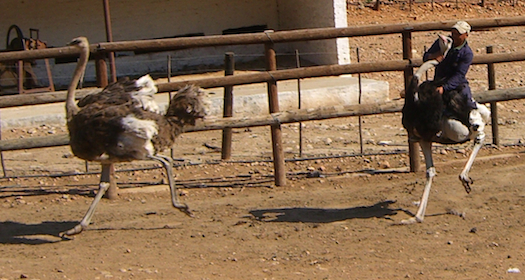 At that size ostriches are big enough to race each other whilst mounted by humans. It’s difficult to say whether the birds would rather be flying but if they fancy a bit of reverse evolution they’re going to need to lose 90% of their weight. The fact that only by limiting themselves to about 15 kg can birds manage to get airborne is one indicator of the energy required for flight. Three at this edge of evolution are the Andean condor, the wandering albatross and various bustards, each needing a wingspan of around three metres to generate the lift required to get something like 15 kg into the air. The point about all these wonderful creatures is that they’ve evolved to survive in very specific niches where they live life on a knife-edge. Recall the Manchurian Great bustard who put on a bit of weight and seemingly lost the capacity to fly: his wing muscles couldn’t generate enough lift to get his 21 kg airborne. Or hummingbirds some of which can manage thousands of wing beats per minute but are constantly on the verge of starvation because they need to drink more than their own weight in nectar each day to generate the energy they use. One of these marvellous vertebrate species is, of course, us – Homo sapiens – and we’ve been diligently carving out our niche for the past 200,000 years. Allegedly because of our larger brains, we’ve been more successful than any other species and managed to colonise pretty well every corner of all seven continents. That shows amazing adaptability for one species – a bunch of animals that are, to a first approximation, genetically identical. Ah! What a splendid word approximation is. We are indeed 99.9% identical in the genetic code – the sequence of bases in our DNA – that makes us. But we all know, of course, that we are not identical. We’re so not identical that everyone is almost instantly distinguishable from the other seven billion souls elbowing each other for living space on the planet. Two of our most obvious features are skin colour, variations in which have helped us make our homes in hot and cold climates alike, and height. The height range for adults is quite remarkable – from 2 ft (under 60 centimetres) to 8 ft 6 in (over 260 cms) – although exceptional height variation (20% deviation from the average) within a population is sometimes due to medical conditions. Mention of populations raises another familiar point: average heights vary significantly between human populations. Thus for males in the UK and the USA it is 5 ft 10 inches, in Vietnam and Bolivia it’s 5 ft 5, in Japan 5 ft 7 and those Scandinavian chappies clock in at 5 ft 11 inches. Our northern relatives are an example of the rule named after the nineteenth-century German biologist Carl Bergmann who noted that for closely related populations within a species those of larger size are found in colder environments, whilst the smaller guys stick to warmer regions. What makes humans differ in height? Nearly identical though we are, the answer has to lie in our genetic material or, more precisely, in the sequence of bases (A, C, G and T) that make up DNA. The difference lies in the detail: in the one in a thousand of the three thousand million bases that make up our genomes that differ between you and me (see Policing DNA). Known as common genetic variants, these inherited differences are what make us unique. The advent of high-powered DNA sequencing methods in the last 10 years means we can now screen large numbers of genomes to pin down the variants that associate with diseases and traits. Several such studies have focused on height and the most recent has sequenced DNA from more than 250,000 people and found nearly 700 variants that account for about 20% of the hereditability of height. That says there’s still more to be discovered but the basic message is that a very large but finite number of variants, i.e. several thousand sequence differences, each by itself insignificant, contribute an overall effect – how tall you are – even though other factors, notably childhood nutrition, can play a role. Although the DNA variants are scattered throughout the genome, it seems likely that their effects are concentrated on specific pathways involved in cell proliferation and skeletal development. Why are we interested in height? In A Taxing Inheritance we tried to explain that, although cancers are mostly driven by the accumulation of mutations, i.e. changes in DNA that alter the activity of proteins and accumulate throughout life, about one in ten are given a kind of flying start when a mutation occurs before birth – i.e. they occur in an egg or sperm cell or just after fertilization. However, the number of such mutations that have been discovered accounts for only about a quarter of inherited breast cancers. The rest get their initial impetus from common genetic variants, in a way that closely parallels the regulation of height by a sub-set of variants. That is, differences at single positions within the genetic code – on their own insignificant – can, in combination, produce a significant effect. When the effect is an increased risk of cancer it may take many years to show itself whereas the impact on height becomes apparent early in development. Having used height as an example of common genetic variants in action, one might ask the rather obvious question of whether there is any link between height and cancer and indeed several studies have shown that there is. In a large group of postmenopausal women (over 20,000) height was positively associated with risk of all cancers, every four inch change in height giving a 13 percent increase in risk. Another study concluded that tall men have slightly higher risk for aggressive prostate cancer. So there’s a link between being tall and cancer – but don’t panic! Like a good few other things in life, there’s nothing you can do about it. Bear in mind that, cancer apart, tallness, particularly in men, may be a boon and not just when you’re trying to watch footy. There’s evidence that shorter adults (below 160.5cm / 5ft 3in) are about 50% more likely to have a heart attack or die from heart disease than tall people. Finally, this piece is to make the point that there isn’t a ‘height gene’ – just a large number of permutations in the variable bits of our genomes that determine how lofty we become. Similar permutations also determine most of the risk of inheriting breast cancer but we can’t do anything about that either. So the long and short of it is love the science – and love your size! Wood, A.R. et al. (2014). Defining the role of common variation in the genomic and biological architecture of adult human height. Nature Genetics 46, 1173–1186. Kabat, G.C. et al. (2013). Adult Stature and Risk of Cancer at Different Anatomic Sites in a Cohort of Postmenopausal Women. Cancer Epidemiol Biomarkers Prev., 22, 1–11. Zuccolo, L. et al. (2008). Height and Prostate Cancer Risk: A Large Nested Case-Control Study (ProtecT) and Meta-analysis. Cancer Epidemiol Biomarkers Prev., 17, 2325–2336. I often make the point in these pages that we desperately need new and more sensitive ways of detecting cancers. One approach is to find molecules – biomarkers – that reflect their presence and can be readily detected in, say, blood samples. This is a specialised field – called metabolomics – essentially identifying chemical fingerprints. Those wanting to know more (a lot more!) can find it in a new book “Metabolomics and Systems Biology in Human Health and Medicine”, edited by Dr. Oliver Jones of RMIT University, Australia. 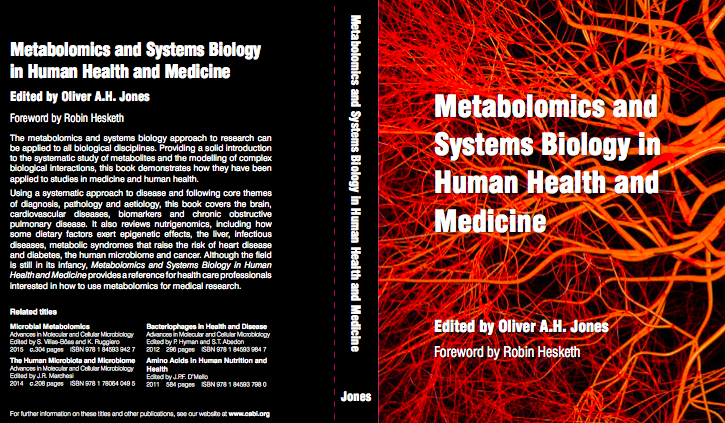 The book provides a solid introduction to medical metabolomics and systems biology, showing how they have been applied to medicine and human health, including nutrition and pathogenic microorganisms. Following core themes of diagnosis, pathology and aetiology of disease, this book provides a reference for health care professionals interested in how to use metabolomics for medical research. Find out more at http://www.cabi.org/bookshop/book/2553 and anybody can get 20% off the price with code CCMSB20 before the end of 2014.